Excellent working condition, except the"previous button" does not work. Surface scratches as shown. they do not affect the performance or screen viewability. Protective black silicone case and retractable cord as pictured included. For Sale :Apple iPod Nano 5th Generation Orange (16GB) - A1320 - Fully Working - B Grade. iPod nano works great internally (even has a pedometer which isn't a function I've seen before), but it has a good amount of scratches and dings. The lock button at the top takes some effort to slide back and forth. It appears that it's been dropped multiple times. Works great though! Comes with charger! Good overall condition. I will start with the bad. Has a few light scratches on the screen and one pretty good scratch. Hard to notice when the ipod is on but can diffidently see when its off. One scratch has a little paint chipped off. iPod Nano 5th Generation 16GB -- Silver New LCD. New Battery. Condition is Seller refurbished. Shipped with USPS First Class Package. Pics are of the device. Up for sale is a pre-owned iPod Nano 5th Generation 16GB -- Pink (MC075LL), It's in very good condition. Apple iPod Nano 5th Generation 16GB green w/Video Camera A1320. Condition is Used. Shipped with USPS First Class Package. Apple iPod nano 5th Generation Black (16 GB). Condition is Used. Shipped with USPS First Class Package. Apple iPod nano 5th Generation Silver (16 GB). Condition is Used. Shipped with USPS First Class Package. For sale is this 16gb 5th Generation Pink Apple Ipod Nano. This Ipod is in fully working used condition.A few very light scratches but still looks great overall. Screen in great condition. It functions fully and perfectly. Apple iPod nano 5th Generation Silver 16gb A1320 MC060LL - Working. Condition is Used. Shipped with USPS First Class Package. Comes with original box charger and manual. Works perfectly questions please ask. 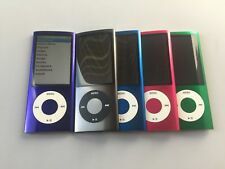 Apple iPod nano 5th Generation Purple (16 GB). Condition is Used. Shipped with USPS First Class Package. What's Included: iPod Only. Works great. Has heavy signs of use. Trending at $60.98eBay determines this price through a machine learned model of the product's sale prices within the last 90 days. Apple iPod Nano 5th Generation - Product Red (16 GB). Condition is Used. Shipped with USPS First Class Package. Very Good condition, tested. Everything works, light scratches. 40 songs on the iPod. As you can see from the pictures, the iPod is in excellent shape. APPLE IPOD NANO 5TH GENERATION - 16GB - BLACK. Used, 100% tested and is in great working condition. We will do our best to make it right! Sides/corners: Minor nicks. Front: Minor scratches. It has a tendency to switch from on to off so I have always used it in the 'off' toggle position. Apple ipod nano 5th generation (16gb ) Green in good condition.Has been tested. fully functional.Work great .Battery hold chargei ipod has some minor scratches from nomal use..No charger & cable.ipod only Please see photos before buying. Apple iPod nano 5th Generation Green (16 GB). Condition is For parts or not working. Shipped with USPS First Class Package. Everything about it seems to work except for the display. Could be useful as a simple music player or great for parts. Will send to you freshly restored. THE IPOD IS FULLY FUNCTIONAL BUT THE LCD HAS VERY SMALL WHITE PRESSURE POINTS ON THE BOTTOM THAT DOES NOT AFFECT THE VIEWING AT ALL. Trending at $74.00eBay determines this price through a machine learned model of the product's sale prices within the last 90 days. For sale is this 16gb 5th Generation Purple Apple Ipod Nano. This Ipod is in fully working used condition. It shows scratches and scuffs but still looks decent overall. Screen in good condition. iPod is in good used cosmetic condition with light to normal cosmetic wear. There may be some scratches and/or scuff marks on the device itself. Overall the condition will range from 7 to about 9 out of 10. Device is in 100% working condition, fully functional. Apple Limited Warranty expired. 8GB storage capacity. Photos are for generic purposes only to represent condition and are not the actual device you will receive. iPod comes with a generic USB data sync cable. Orange Apple iPod Nano 16GB 5th Generation Tester And Working! Free Shipping! IPod is in good condition overall with typical scratches around the body from primal use. iPod is 16gb storage and orangein color. iPod only, no cables. 4.5 out of 5 stars - Orange Apple iPod Nano 16GB 5th Generation Tester And Working! Free Shipping! 60 product ratings60 product ratings - Orange Apple iPod Nano 16GB 5th Generation Tester And Working! Free Shipping! Apple iPod nano 5th Generation Black (16 GB) New Battery Installed for good measure. Fully Functiona. Condition is Seller refurbished. Shipped with USPS First Class Package. Pics are of the device and what’s included. May be less. Needs a new battery for sure. New 30 pin cable. New Battery. Pics are of the device. Subcategory: Nano. Storage: 16 GB. Generation: 5th. The ipod is in good condition but has some dings on the bottom and top along the edges. I will include a usb cable. 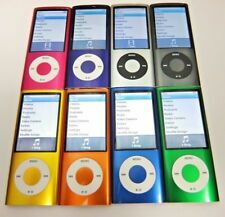 IPod nano 5th generation 16gb (Orange). For sale is this 16gb 5th Generation Pink Apple Ipod Nano. This Ipod is in fully working used condition.A few light scratches but still looks good overall. Screen in good condition. It functions fully and perfectly. Apple iPod nano 4th Generation Gold / yellow (16 GB) Lightening Cable Charger Included. Condition is Used. Please see pics, it does have some light scratches to the body and some small dings. Screen is perfect, no issues. Works! Does have “you are my sunshine my only sunshine” on the back. Shipped with USPS First Class Package. Free shipping in USA only.